The other day I was thinking about what kind of Mexican style food I could make that would not only LOOK the part, but taste satisfying too. The idea hit me that if I melted cheese to JUST the right consistency I could roll it around some stuffing to make an Enchilada type of dish. Usually when it comes to traditional enchiladas I prefer cheese enchiladas with red sauce, but I thought that stuffing Cheese with Cheese might be overkill. (Feel free to knock yourself out though if you want to try that cheese inception). I usually buy my Rotisserie Chickens from the store, and strip all of the meat off of them for various recipes, but you can feel free to use an air fryer to make your own bone-in Chicken Breast or Roasted Chicken if you want to. I would not recommend trying to make this recipe with canned chicken though. 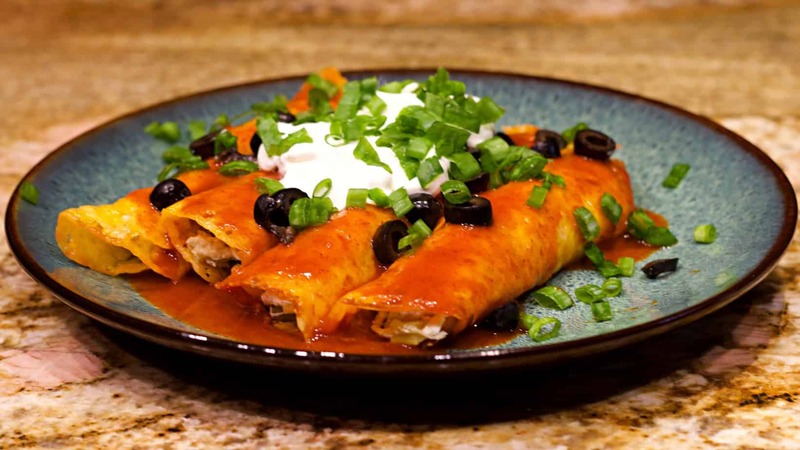 My wife and I both think that this dish not only satisfies all of our cravings for enchiladas, but it probably also tasted even better than the real thing. Somehow having the melty cheese as the corn tortilla replacement makes this taste even more rich and satisfying. Shred the Rotisserie Chicken Breast with two forks until uniformly separated. Add Green Chilis to the Chicken and stir. On a Large Baking Sheet, cover it with 2 pieces of Parchment Paper cut in half. It is important that you cut this down the middle now, as it will make the later steps much easier. Place the shredded cheese onto the baking sheet in Four equal sized piles. Bake the Cheese in the oven at 350*F for about 7 minutes, or until it is bubbling hot AND the edges just begin to get a brown crisp to them. When the cheese is ready, remove from the oven and spoon the Chicken and Green Chili mixture into the Cheese near the edge that is closest to you. You do not want to place it in the middle like a taco, as you are going to be rolling this into an Enchilada. Roll the cheese carefully over the chicken to make a solid “tortilla”-style roll. Place onto plate, and spoon on the Red Enchilada Sauce mixture. Top with Sliced Black Olives, Sour Cream, and Chopped Green Onion. SPECIAL NOTE: The nutrition facts include ALL of the ingredients, so if you want to make this dish even MORE LOW CARB you can cut out the Sour Cream, Olives, and Green Onion, and you would make this dish almost Completely CARB-FREE. Serves 2 Adults. Each serving is calculated as 2 Enchiladas per serving. This was delicious. I made a big one in a pizza pan rolled it and cut it in meal portions. Very Good. You made a pizza sized Enchilada?! Would love to see that! Made this tonight and was pretty good. I did use green enchilada sauce and made 1 big 14″ one instead of 4 smaller ones. The cheese was a little thick for me, so next time I will think it out some. I made this tonight and it was a huge hit. My hubby who is not really following the keto way of eating loved them. Thanks for such a great recipe!! Perdue makes several types of fresh chicken just for this purpose. Not fond of rotisserie chicken. If I eat four enchilades it will be 14 carbs? If you eat four enchiladas that is a total of 10 Net Carbs. But that also takes into consideration that you are eating it with the olives, sour cream, and green onion. If you cut those out you drop it down to about 1-2 Net Carbs per Enchilada. I’m confused about count. Pre shredded cheese has 2 carbs per ounce. I can’t find any block cheese called Mexican style. I am not sure what kind of Pre-Shredded Cheese you have purchased, but all of the shredded cheese we have at home in the fridge have zero carbs. Are you certain that you have purchased natural cheese and not a Processed Cheese Product like Velveeta? The fake cheeses are probably going to have carbs in them if you use those. I like the Kraft 4-Cheese Mexican blend but I noticed it has 1g of Carbs for a 1/4 cup and no fiber. I think I will just get some blocks of Jack and cheddar cheeses, and shred my own mix. Yeah, shy away from cheeses that show carbs. That usually means there are other no-no’s added to the cheese. You have to look at the nutritional information on shredded cheese. Some companies put corn starch in it to keep the cheese from sticking together. Also, Mexican cheese is a blend of cheeses. Look for what cheeses are blended and go from there. Not ALL pre-shreds have it, but yes read your labels! No need to be getting cornstarch in there. Some shredded versions also add potato flakes. That adds to the carbs. Almost all cheese has no carbs in it. Just make sure you are not buying things that are “Processed Cheese” aka Kraft Singles or Velvetta type. It also doesn’t matter if it is “Mexican” cheese or not. Sharp cheddar works just fine. I’ve made these several times and used whatever I have, ie. ground beef, chicken, even turkey. The sauce and garnishes aren’t necessary either, although they add interest to the dish. I didn’t use Mexican style cheese because I’m NSNG and stay away from starches that are in pre-shredded cheeses. I used a block of cheddar for the “tortilla”. Soooooo delicious. Cojito cheese is what I think it is – a white cheese. You can use Monterey Jack or Cotija Cheese El Mexicano Queso Cotija. You can get both in most grocery stores. What would you serve on the side? Beans aren’t low carb…so if your goal is LC, no beans! Refried beans aren’t keto friendly. black beans of course. very good for you. forget the carbs. 135% saturated fat. another side could be chopped red, yellow green peeper, red onion, avocado drizzled with seasoned olive oil. we have chili seasoned olive oil. Yum! I will have to try that for my Fajitas! Trader Joes has a grated cauliflower with sweet pepper in it that taste’s wonderful! My husband thinks it’s rice and enjoys it. He hates cauliflower…..
Mexican Slaw. Which is just grated cabbage, with a spicy dressing. I do this all the time. If want to add heat , finely mince 1 seeded fresh jalapeno. Make ahead so the flavors meld together. “Parchment Paper cut in half. It is important that you cut this down the middle now, as it will make the later steps much easier.” What were the steps? Didn’t see paper mentioned after that. You bake the cheese shells on the parchment paper, and then roll them later. I should embed the video here, that will help. Why was the parchment paper cut in half? It makes it easier to roll the cheese later without having to roll the whole sheet at once. Or you can just roll from outsides inward. This was a very delicious recipes and will be a keeper for my family. I honestly think it was better than corn tortilla enchiladas! I substituted the sour cream with plain Greek yogurt and did without the olives. is there a certain brand of saice that is better keto or are they all the same? The brands that I look for don’t have Corn Starch or Modified Vegetable Starch. And of course make sure they don’t have added sugar either. Can the cheese shells keep overnight? I am so glad I stumbled upon this recipe earlier this week. My husband and I loved it! We made chicken enchiladas one night and beef enchiladas two nights later. Thank you so much! We had the chicken ones two days in a row. They were so good! When I click the print icon, the recipe with photographs is on four pages. Can someone please reformat the recipe to fit on two pages? I am new to the site and when my husband likes a recipe I print it out to use later. Thank you. I use the ” Copy me that ” app, it puts the recipes in an app for me with the link to the original post with pictures. That way I don’need to print them they are stored in my app and if I need to I can share my recipe book from the app to my friends and family. Yeah, you need parchment paper. And as noted, you should bake the cheese beyond its bubbling point until the outer edges just begin to brown. I have seen some great failed attempts at baking the cheese where they tried on aluminum foil or wax paper, only to find that the cheese wont come off. I always use this to make crispy cheese chips too. Drop several tablespoon each of grated cheese on parchment paper (no need to cut the paper in half) microwave until lite brown on the edges and bubbly in the center, about 2 minutes. Let cool. Cheese chips! Yum! I did it on wax. Oops, but I slowly and painstakingly got the cheese to roll and loved it! Next time I’ll do it on parchment paper! This looks super tastey. However that is a lot of protein. I would consider switching the breast with thighs or even crumbled bacon or both also add more fat possibly guac or cream cheese and heavy whipping cream. Good luck everone. Keto is hard but not impossible. I added a little cream cheese and it was excellent. I would really like a printed version of your Ketosis coolbook. I cancelled my order a couple of weeks ago because It was online only! Any possibility of a paper printed cookbook?? Cydney, I do not have a cookbook for sale. Maybe some day in the future I will print one out. For now I am sharing everything for free on my site here! do you spread out the cheese into a tortilla shape or leave in more of a mound? mine were deliciois but would like them a little crisper. I sprinkle the cheese in a circle shape. The trick to making them crisp is to let them bubble long enough that the outside of the cheese turns that medium brown color. If you want them more like a taquito you can cook them even longer and then roll before the cheese cools down. Make America Grate Again ???????????????????? Why wouldn,t you use canned chicken? Because it tastes like Tuna to me (usually brined in a similar solution) so I wouldn’t want to think I was eating a Tuna Enchilada. That’s the only reason. If you don’t like rolling in cheese, what about thin slices of zucchini or the 4g carb tortillas I’ve heard about? Do you use fresh diced green chili’s or canned diced green chili’s? I used canned in this recipe because I did not re-cook the chicken (used the meat from a rotisserie chicken). But you can use fresh roasted green chilis too, I just wouldn’t use raw unless you plan to cook your chicken from raw too. 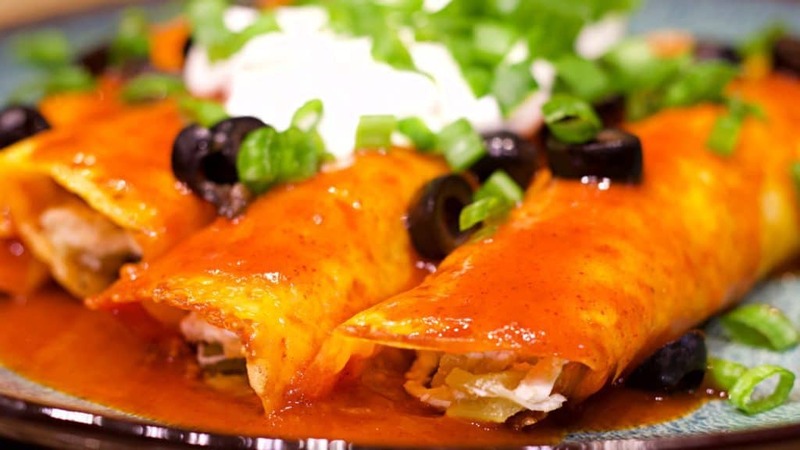 How many ounces of chicken are you using per enchilada? Breaths differ in size. Thanks. I tried them. Cut the recipe in half just for me. Easy to rolls the cheese. Could have left off the olives and if I had, could I have used avocado instead? You could definitely use avocados! I did not weight the breast, it came off of a rotisserie chicken. These were wonderful. I forgot the green chilis when I went to the store, so I added a couple of spoonfuls of a taco seasoning package.to the shredded chicken and then added water and a few tbs. of sour cream and let them cook down to a beautiful creamy mess. I made a plate garnish of lettuce, chopped tomato, and chopped avocado. They were wonderful. My husband keeps saying this is the best tasting food we have ever had on a diet. Thanks for the tip on prepackaged cheese, I had forgotten that. this is my 6 day on the diet and I’ve lost 4 pounds. I do have the keto flu and last night was really craving something sweet so I had a bowl or berries with a splash of cream and some stevia, it was nirvana. A perfect dessert! Thank you for your recipes I needed the help this week so much. How many enchiladas does this recipe make with the amount of ingredients posted in the recipe? You can get away with pre-making the chicken, but you want to make the shells fresh. What about the 3 grams of sugar…sugar will throw you out of ketosis and stall your weight loss. That’s why you monitor your sugar intake. Most of your net carbs for the day will be sugar, as long as you eat less than the amount you can tolerate in a day you will stay in ketosis. Do these freeze well if you prep them ahead of time and put them in a casserole dish to freeze and warm up later? Karen it sure can. It is hard to wade through all the do’s and don’t.s . My noobie advice is to take a week and just make healthier choices. Nix the soda. Fast food, and as many carbs as you can. During this week read and research. A Keto diet works but you have to be dedicated. Some people and groups are more strict than others. They nit pick ever ingriedient. That comes with time though and learning. Most people want to go Keto to lose lbs and to eat better. You can def do that by learning keto recipes because they are mostly fresh clean recipes. It sure can. I’ve been doing keto for five months, and have lost about sixty pounds. It takes time and effort, and there’ve been some ups and downs – but as long as you stay within your daily allowances for carbs (very few), protein (some), fat (lots) and calories (less than you need to maintain weight), it works. Hello. Does the chicken need to be warm before filling? Not sure if when buying a rotisserie chicken ahead of time if the chicken should be warmed back up before filling. Yes you will want the chicken warm before filling, as I do not cook these further after rolling them up. Yum! Made this using shredded beef, added a sprinkle of garlic powder to the cheese before I baked it. I got 3 shells out of the 2 cups of cheese and I ate every one of them! Too full but I really wanted pictures so I made the 3rd one and took some good pictures of it before I ate it! ???????????????? So glad that you liked them Cynthia! I think this recipe is great (as does my husband). It is now in our rotation.